Originally written as a report to the United Nations Conference on Human Settlements, 1997, Globalizing Civil Society was subsequently published by Seven Stories Press in their pamphlet series. It takes the world’s governments to task for failing to address growing hunger, housing shortages, unemployment, poverty, human rights abuses, and environmental degradation. 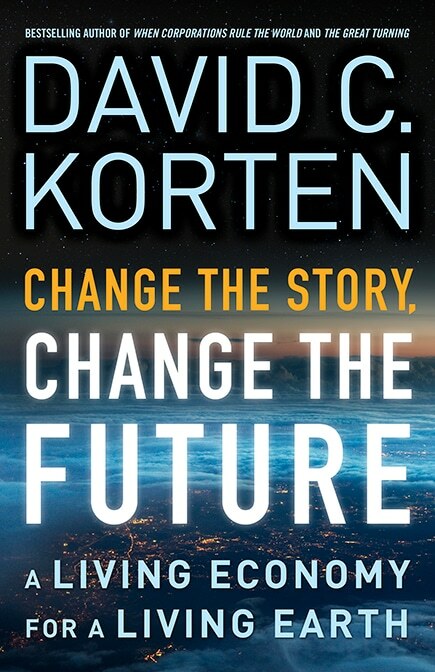 Examining the causes of this global crisis and offers fresh solutions to achieve sustainability, community, and equity—the essentials of a healthy future for the world’s people—it concludes that a more hopeful human future depends on broadly based citizen action to establish the accountability of corporations and governments to the popular will. During the latter part of the second millennium, and in particular the twentieth century, the lives of most of the world’s people have become increasingly divided between two parallel and intertwined realities. One reality-the world of money-is governed by the rules set by governments and central banks and by the dynamics of financial markets. The other-the world of life-is governed by the laws of nature. In the world of money, the health of society and its institutions is measured by financial and economic indicators-by growth in such things as economic output, stock prices, trade, investment, and tax receipts. In the world of money, continuous, sustained growth seems to be the primary imperative. Because they are structured to seek ever-increasing productivity and profits, modern economies either grow in terms of the monetary value of their output, or they collapse. The growth imperative of the money world finds expression in the notion of development as an unending process of economic expansion-which has been the organizing principle of public policy for most of the last half of this century. The living world is governed by quite different imperatives. Here healthy function manifests itself in balance, diversity, sufficiency, synergy, and regenerative vitality. Growth is an integral part of the living world, but only as a clearly defined segment of the life cycle of individual organisms. The sustained physical growth of any individual organism or unlimited numerical expansion of any species is an indicator of system dysfunction and poses a threat to system integrity. Thus growth in the living world tends to be self-limiting-as with a cancer that condemns its host or a species whose numbers upset the ecological balance and ultimately destroy its food supply. Growth is an integral part of the living world, but only as a clearly defined segment of the life cycle of individual organisms. Though as living beings we are creatures of the living world, we have yielded the power of decision in human affairs to the institutions of the money world and for these institutions the imperatives of the world of money take precedence over those of the living world. Money-world institutions have been enormously successful in shaping the twentieth century’s advances in technical and organizational mastery as instruments of economic growth. Indeed they have increased total world economic output from five to seven times over the past fifty years. They have also brought unprecedented material wealth to approximately 20 percent of the world’s people and vast riches to the most fortunate one percent. The world’s power holders, who with few exceptions belong to the most fortunate one percent, understandably see this as a considerable accomplishment. Having experienced the possibilities of the underlying development model, they feel affirmed in their belief that the systems of governance that allocate the world’s resources are fundamentally sound. Shielded by their wealth from sharing in the living-world consequences of money-world decisions, those consequences lack-for them-a compelling sense of reality. From the perspective of the living world, however, the consequences of the economic development/growth agenda have been disastrous. Here we see that each addition to economic output results in a comparable increase in the stress that humans place on the earth’s ecosystem, deepens the poverty of those whose resources have been expropriated and labor exploited to fuel the engines of growth, and accelerates the destruction of non-human species. The terrible costs fall on those who are denied a political voice-the poor, the young, and generations yet unborn. Most of the benefit of increased economic output is going to those who already enjoy a substantial level of physical comfort and security-contributing more to an increase in inequality than to a reduction in poverty. A single statistic reveals how obscene inequality has become. In 1996 the world had 447 billionaires, up from 274 in 1991. Their combined net worth equals the estimated combined annual income of the poorest half of humanity. Denied both a political voice and economic opportunity, the excluded are often left with crime and violence as their only evident avenues for survival, self-expression, and individual advancement. Violence in the home and in the streets has become a pervasive part of the human experience. We must consider what must be done to address unmet needs for human shelter, community, and livelihoods. Military conflicts-sponsored by some of the same governments and supplied by a flourishing international arms trade- are systematically destroying existing housing stocks, communities, and livelihoods in campaigns of terror and genocide. The landmines that are but one legacy of these conflicts will render vast areas of desperately needed land unsafe for habitation or cultivation for decades to come. Such armed conflicts are a primary cause of an alarming increase in the number of refugees in the world. In 1960, the UN listed 1.4 million international refugees. By 1992, the number had grown to 18.2 million. The UN estimates that currently an additional 24 million people are displaced within the borders of their own countries. The consequences of the economic development/growth agenda have been disastrous. No less tragic is the suffering of the tens of millions of development refugees, the victims of the silent violence of development projects that expropriate-and often destroy-their homes, lands, waters, and fisheries for uses such as hydroelectric dams, tree plantations, and urban development projects that often benefit fewer people-usually better off-than those they displace. These development refugees are deprived of shelter, community, and means of livelihood just as certainly as are the victims of organized armed violence. The evidence is mounting. Despite impressive increases in average life spans, a major portion of humanity has gained little benefit-and in many instances suffered considerable loss-from the economic prosperity that has brought unimaginable wealth to a few. In short, while the long term trends in the money world point toward ever-increasing prosperity, the long-term trends in the living world point to growing imbalance, instability, and system stress. Dealing with this reality is basic to any effort to create socially and environmentally sustainable human settlements. In large measure, the crisis of global-scale social and environmental disintegration now underway can be explained in terms of a confrontation between the conflicting imperatives of the money world-which holds the power of decision-and the living world of people and nature-which bears the tragic consequences of those decisions. Continued economic growth on a finite planet with an already overtaxed ecosystem accelerates environmental breakdown, intensifies the competition for resources between rich and poor, and deprives future generations of the necessary means to meet their basic needs. This is confirmed by a growing body of evidence that many of the world’s ocean fisheries, fresh water resources, and farm and forest lands are being exploited at rates substantially greater than their ability to regenerate. Expansion of the market economy ever more activities once performed by households and communities is monetizing human relationships, weakening the social fabric, and destroying livelihoods faster than jobs offering, more than poverty-level compensation are being created. The institutions of a globalized, free market economy that control privatized assets respond only to the imperatives of the money world. They are virtually blind to the imperatives of the living world. 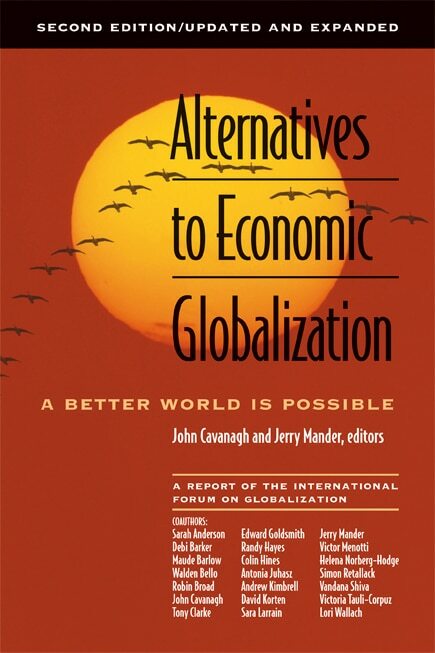 Economic globalization is shifting control over resources, markets, and technology from people, communities, and governments to transnational financial markets and corporations- placing these institutions beyond the reach of public accountability, making responsible local action to meet local needs increasingly difficult, and creating dangerous financial instability. A free market allocates fairly and efficiently only when market players have equal economic power. When extreme economic inequality is combined with market deregulation, the rich invariably win the competition for scarce resources-with results that are neither fair, nor efficient. 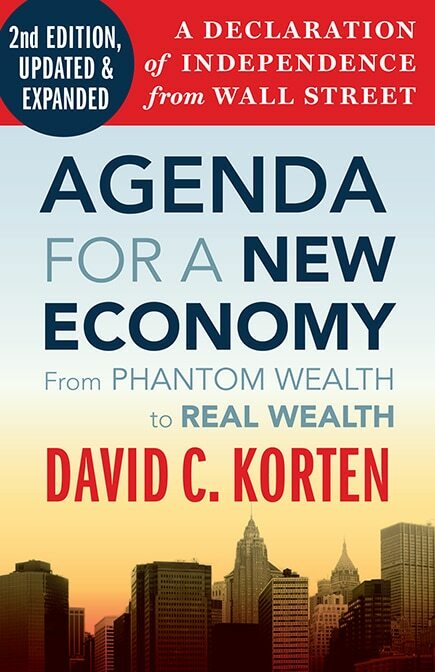 The wealthy become ever more powerful, gain control of the rule-making system, and accelerate the process of rewriting society’s rules to their own advantage. A free market allocates fairly and efficiently only when market players have equal economic power. Social services used by the jobless and the working poor are cut back in the name of fiscal responsibility. Tax structures become more regressive as subsidies and tax breaks are granted to the most wealthy investors in the name of job creation. 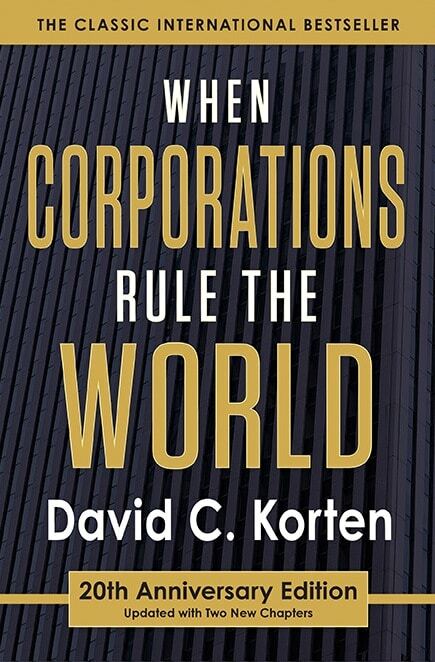 Regulatory restraints on the concentration and abuse of corporate power are relaxed. Such agendas are being advanced by elite interests all over the world-by right wing political movements in the North and through structural adjustment programs implemented by the World Bank and the International Monetary Fund (IMF) in the South. One of the challenges to colonial administrators was that many colonized people obtained their livelihoods from their own lands and common areas. For colonists to profit from the lands, labor, and consumption of subjected people it was necessary to force them into dependence on a money economy. This was accomplished by such measures as limiting access to common lands by declaring all “uncultivated” lands property of the colonial administration and by imposing taxes payable only in cash. A combination of economic globalization and productivity-enhancing technology continue to transform economic relations in ways that add to widespread inequality and instability. Trade agreements negotiated under the General Agreement on Tariffs and Trade (GATT), the structural adjustment policies of the World Bank and International Monetary Fund (IMF}, and advances in communications technology are melding national economies into a seamless global economy. Transnational corporations are more able to shift the production to localities that offer lower production costs without fear of losing access to more affluent markets. At the same time, advanced information technologies are making it possible for a small fraction of the potential workforce to produce most of the goods and services the global marketplace is able to absorb. 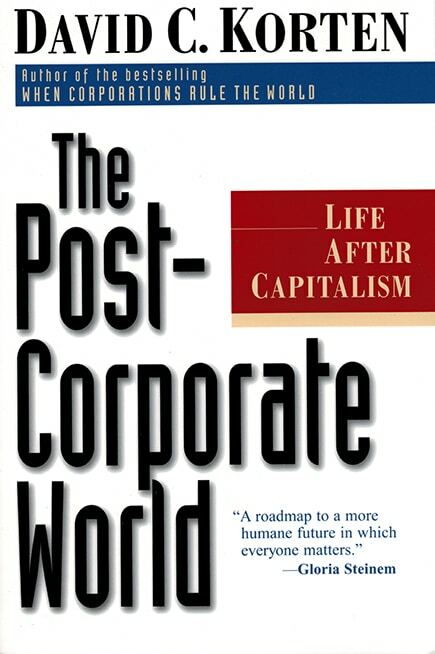 The U.S. Fortune 500 industrial corporations reduced their total employment by 4.4 million jobs between 1980 and 1993-a period during which their sales increased by 1.4 times, assets by 2.3 times, and CEO compensation by 6.1 times. possible for a small fraction of the potential workforce to produce most of the goods and services the global marketplace is able to absorb.While the giants are shedding people, they are not shedding control over money, markets, or technology. The world’s 200 largest industrial corporations, which employ only one-third of the world’s population, control 28 percent of the world’s economic output. The top 300 transnationals, excluding financial institutions, own some 25 percent of the world’s productive assets. Of the world’s 100 largest economies, 51 are now corporations- not including banking and financial institutions. The combined assets of the world’s 50 largest commercial Banks and diversified financial companies amount to nearly 60 percent of The Economist’s estimate of a $20 trillion global stock of productive capital. Concentration of control over markets is proceeding apace. The Economist recently reported that in the consumer durables industry the top five firms control nearly 70 percent of the entire world market, a ratio that economists consider highly monopolistic. In the automotive, airline, aerospace, electronic components, electrical and electronics, and steel industries the top five firms control more than 50 percent of the global market, placing them clearly in the category of monopolistic industries. In the oil, personal computers and media industries the top five firms control more than 40 percent of sales, which indicates strong monopolistic tendencies. Yet the consolidation continues with no end in sight. The total value of mergers and acquisitions completed worldwide during 1995 was expected to reach $800 billion-exceeding the total for any previous year by more than 25 percent. The same firms shedding employees while tightening control over capital and markets are also shedding their obligation to provide good wages and working conditions for those who produce the goods and services they sell. The popular Nike athletic shoes that sell for US $73 to $ 135 around the world are produced by 75,000 workers employed by independent contractors in low income countries. A substantial portion of these workers are in Indonesia-mostly women and girls housed in company barracks, paid as little as 15 cents an hour, and required to work mandatory overtime. Unions are forbidden and strikes are broken up by the military. In 1992, Michael Jordan reportedly received $20 million from the Nike corporation to promote the sale of its shoes, more than the total compensation paid to the Indonesian women who made them. An unregulated global market is shifting the financial rewards away from those who produce what others need to those who control money and are successful at convincing others to buy what they neither need nor can afford. The living world cries out for more cooperation among localities toward the creation of higher social and environmental standards. Yet people and communities on opposite sides of the globe are pitted against one another in a desperate global competition for the available jobs by outdoing one another in courting corporate favor by offering ever more attractive subsidies and tax holidays, lower wages, and lax environmental and employment standards. The corporations that are the most visible players in this global “race for the bottom” are themselves captive to the dynamics of a world financial system that gives them little freedom to manage their affairs with the broader public interest in mind. More than $1 trillion changes hands each day in the world’s international currency markets-seeking short-term financial returns unrelated to the production or trade of any actual goods or services. The globalized financial system has become a giant gambling casino in which the players are betting on short-term fluctuations in the prices of financial instruments in search of instant gains unrelated to productive contribution. Such gains are almost inherently extractive, meaning that they make no consequential contribution to adding value to any real product. They depend on extracting wealth from others who are doing productive work and making real long-term investment in the production of needed goods and services. The players in these markets operate in a virtual reality of cyberspace, a world of pure money wholly detached from the living world and blind to its imperatives. Of course currency traders are a minority of the professionals who manage the investment pools controlled by large investment houses, banks, mutual funds, and retirement funds. The dynamics are similar, however, even with those whose trades involve stocks and bonds that represent ownership shares in real companies. Whether their decisions contribute to creating real goods and services that people want and need is not their concern. The pressures for instant gains encourage excesses that make the entire financial system increasingly unstable. This instability and its real world consequences were starkly revealed in the Mexican pesos crisis of December 1994. Until the moment of the crash, Mexico was being touted as an economic miracle. Yet what looked like a dynamic economy was mainly an illusion created by Mexico’s success in attracting $70 billion in foreign money over five years with high interest bonds and a super-heated stock market. As little as 10 percent of this money went into real investment. Most of it financed consumer imports, capital flight, and debt service payments. It also helped to create 24 Mexican billionaires. The bubble burst in December 1994 as the hot money rushed out. Mexico’s stock market and the value of the peso plummeted. The subsequent Mexican austerity policy and a shifting terms of trade between the United States and Mexico resulted in massive job losses on both sides of the border. U.S. President Clinton responded by putting together a $50 billion bailout package at taxpayer expense to assure that the Wall Street firms that held Mexican bonds would be repaid. The new link between the dollar and the peso made currency speculators nervous and the value of the dollar fell sharply against the yen. Not a penny of the bailout money went to 750,000 Mexicans who would be put out of work by government imposed austerity measures. Subsequent financial failures in Thailand, Malaysia, Indonesia, the Philippines, South Korea, and Brazil followed similar patterns. And like Mexico, they elicited a commitment of billions of dollars in public money to protect the foreign bankers. More than any other human institution, the global financial system in which hundreds of billions of dollars move unimpeded across national borders at the first hint of changing financial prospects is setting the world’s social and economic priorities. Yet the social and environmental consequences of the actions for which the major players in that system reap handsome rewards, never register on their computer screens. As evidence mounts of the failure of our mega-institutions to deal with two of the most fundamental requirements of healthy social function-economic justice and environmental sustainability-fear, disillusionment, and distrust increase and the legitimacy of these institutions erodes. This opens the way to growing political extremism and instability and creates a fertile ground for demagogues who build their political base on foundations of ethnic, racial, and religious hatred and violence. The resulting social breakdown is already well advanced in many parts of the world-most particularly in Africa and many inner cities of both North and South. Until the underlying institutional causes of growing injustice and unsustainable exploitation of the ecosystem are addressed, the crises will almost certainly continue to deepen. There are signs throughout the world of a political and spiritual awakening of civil society to the reality that national and global institutions are pursuing agendas at odds with the needs of people and other living things. Countless citizen initiatives prompted by this awakening are coalescing into a global political movement for transformational change. The emergent social forces find expression in local initiatives aimed at regenerating local economies, ecosystems, and communities. For example, J the United Nations Conference on Environment and Development (UNCED} inspired initiatives in more than 3,000 communities around the world to create local Agenda 21s. As people reclaim responsibility, they are also withdrawing the legitimacy from the institutions that have abandoned them, reasserting their basic rights over local resources, and demanding greater public accountability from governments and global corporations. They are also reaching out to form new alliances, both nationally and internationally, with those engaged in similar initiatives. Most of these initiatives are peaceful. Some are not. January 1, 1994 was inaugural day for the North American Free Trade Agreement (NAFTA), which guaranteed the rights of money, goods, and companies to move freely between Mexico, Canada, and the United States without interference from national governments or borders. Business leaders throughout North America were elated by the expanded opportunities to produce cheaply in Mexico on the backs of low paid workers and an unprotected environment while selling dearly in the affluent markets of the United States and Canada. The indigenous peoples of Chiapas State in southeastern Mexico, however, correctly recognized the NAFTA agreement as an extension of economic forces that for generations had step-by-step deprived them of their lands and their livelihoods. In response they launched an armed rebellion against the Mexican government. Their battle cry-“Basta!” (Enough! )-was picked up by popular movements all across Mexico and resonated around the world. Mexican political analyst Gustavo Esteva pronounced the Chiapas rebellion the “first revolution of the twenty-first century.” Revolutions of the twentieth century were contests for state power. By contrast, the Chiapas people struggled for greater local autonomy, economic justice, and political rights within the borders of their own communities. They called on their fellow Mexicans not to take up arms against the state, but rather to join in a broad social movement to liberate local spaces everywhere from political and economic forces that recognize no accountability to people or place-a struggle likely to dominate much of the politics of the 21st century. Elsewhere in North America middle class Canadians have taken up a similar cry. Fed up with a conservative government that seemed to place the rights of global corporations ahead of the rights of Canadian people and communities, they rallied in their October 1993 national election to vote out all but two members of the ruling Tory party from their parliament. It was one of the most sweeping repudiations of a democratically elected government in history. Once seated, the new Liberal party government went on to carry out essentially the same policies as the government the electorate had voted out. It led many Canadians to believe that global economic interests had usurped control over their government and the Canadian economy. A citizen organization, the Council of Canadians, was formed to oppose these forces. When NAFTA came into force at the beginning of 1994, the Council launched an initiative to develop a “Citizens’ Agenda for Canada” to define the kind of society that Canadians want for themselves and their children. By 1997 the Council had reached 100,000 members and continued to grow at a rapid pace. In Brazil a very different citizen initiative was underway to address similar forces. Citizenship Action Against Misery and for Life-a grassroots hunger movement spearheaded by Herbert “Betinho” de Souza of IBASE-sought to transform national politics. Betinho had emerged as a public hero of a successful Brazilian citizen movement that led to the impeachment in 1993 of president Fernando Collor for gross corruption. Once the new government was installed, Betinho decided to capitalize on his reputation and the sense of civic empowerment instilled by the success of the impeachment campaign to mobilize Brazilians behind a national commitment to end the perpetual hunger of 32 million Brazilians who lived on incomes of less than $120 a year. Most Brazilians readily accepted Betinho’s assessment that this situation was a national disgrace in a country with one of the world’s most modern and dynamic economies. Responding to Betinho’s call, some 2.8 million Brazilians organized themselves into neighborhood hunger committees comprised of workers, students, housewives, business persons, artists, and others. As they engaged the task of ending hunger in their respective neighborhoods they were encouraged to ask why so many people could find no opportunity in the midst of a thriving economy. A 1994 survey revealed that roughly a third of Brazil’s adult population contributed personally to the campaign in one way or another. The movement’s participants are encouraged to reflect on the act of befriending and improving the life of a hungry person as both a political and a spiritual experience and as a source of insight into the causes of the dysfunctions of Brazilian society. Facilitated through media presentations and local meetings, citizens are led to a growing awareness of the dynamics of inequality and exclusion that flow from the concentration of economic power in a few giant corporations. In country after country people are demonstrating that they are no longer willing to leave it to mainstream political parties and special interest lobbyists to set the terms of the public policy debate. They are acting to reclaim their basic rights and sovereignty as citizens to recreate their societies in ways that better respond to their needs and aspirations. Many citizen groups are reaching out to form national and international alliances committed to transformational changes aimed at addressing root causes of the growing global crisis. 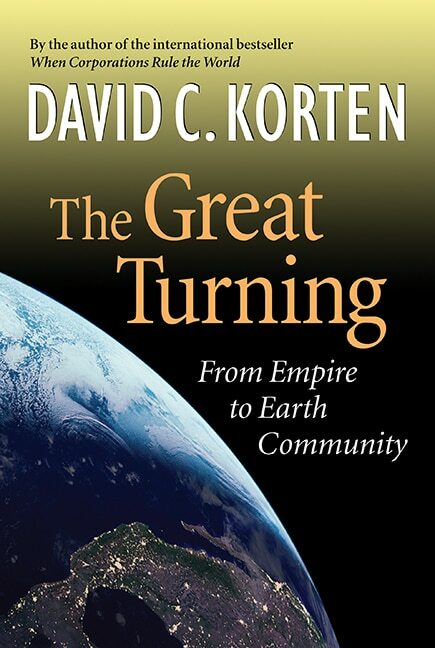 An emergent social movement is coalescing around a shared vision of a world of diverse cultures and just and sustainable communities living in balance with the natural world and joined in cooperative endeavor-not by a global economy ruled by powerful corporations-but by an awareness of the underlying interdependence of the living world. This movement celebrates the emergence of a new global awareness and sense of solidarity that is joining people from every part of the planet in the task of creating a new global civilization grounded in peace and cooperation. This movement gained substantial impetus from the NGO Forum of the United Nations Conference on Environment and Development (UNCED) held in Rio in 1992. This Forum brought together civil society organizations from all around the world to negotiate a series of citizen treaties for creating a just and sustainable world. It was here that the emergent movement began to become more consciously aware of itself as participants from widely diverse backgrounds came to realize the extent to which they shared common values and aspirations. The basic elements of this emergent consensus, as revealed through the discussions of the UNCED NGO Forum and the commitments that flowed from them, were recorded in The People’s Earth Declaration. International women’s organizations have taken a central leadership role in carrying this process forward through the NGO Forums of UNCED and subsequent UN conferences. The movement is now going through a transition, moving beyond the critique of failing institutions to building practical policy agendas for the human future. Here again women are in the lead, moving beyond more traditional gender politics to work on creating an inclusive vision of a world that will provide a better future for everyone-with support and encouragement from the United Nations Women’s Organization (UNIFEM). The needed rethinking of human institutions will not be accomplished in conventional international conferences dominated by the institutions that have created our crisis. We must look for creative new approaches to advancing realization of a citizen-led vision of the human future. It is time for we the people of the world to work together as self-empowered citizens of a small and suffering planet to create just and sustainable societies dedicated to bringing our species into balance with itself and the planet. To do so we will need to reclaim the power we have yielded to institutions that no longer serve the human interest and to create new institutions dedicated to the premise that all power flows from the will and aspirations of the sovereign people. As the Zapatistas have taught us, the challenge is ours and the time is now.